Kroger is an American retailing company first founded back in 1883 in Cincinnati, Ohio where their headquarters remain. They are the third largest retailer in the world, and the second largest general retailer in the United States. Kroger specializes in multiple areas such as grocery, general merchandise, and retail. The Kroger survey is an opportunity to give your feedback to the company about your latest visit. You will answer questions that are usually seen in store feedback surveys such as rating your satisfaction with the department, what you shopped for, the service you received, etc. The questions are typically multiple choice-based. A purchase is not necessary if you want to take part in the Kroger survey sweepstakes. You can mail-in an entry, if you wish. If you want to finish the actual survey, you will need internet access and you will have to keep the store receipt from your latest visit and enter the necessary information from it. The sweepstakes is on a monthly basis. So, your receipt code will expire when the month ends. Enter by mail: You must send in a hand-written card that includes your name, complete address, and phone number. Send it to Customer Survey Monthly Sweepstakes, PMI Station, PO Box 3547, Southbury, CT 06488-3547. 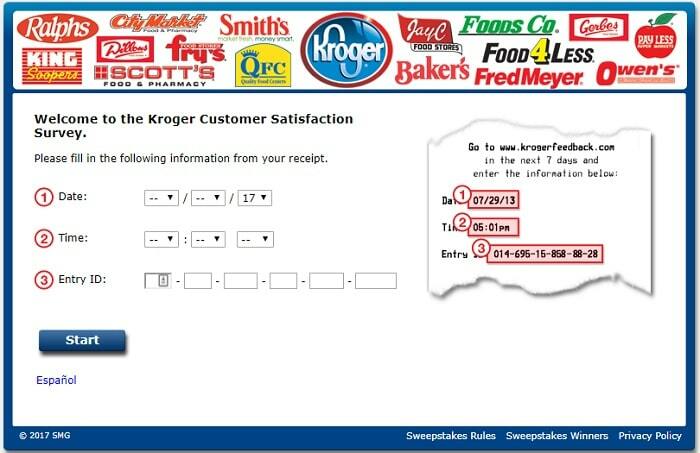 Enter online: With your receipt ready, visit the Kroger survey website and select to view it in English or Spanish. You will enter the following information found on your receipt: date, time of visit, and entry ID. Once the required information is entered, you can begin the Kroger survey. You will answer a series of general questions such as which departments you browsed. Later, you will rate your satisfaction with things like the store’s cleanliness, products, ease of checkout, etc. At the conclusion of the survey, you will be asked if you want to receive additional offers from the store and to enter personal information if you want to gain an entry to the sweepstakes. Kroger has an extensive company website that you can visit to learn more about them, find stores, etc. The Kroger survey is available on a different website. If you want to take the Kroger survey, you must be a legal resident of the United States (excluding those who live in Florida, New York, and Rhode Island) and the District of Columbia. You have to be 18-years-old or older as well. If you are 18 yet aren’t the age of majority in your state, the prize will go to your legal guardian. There are two prizes you can win during their sweepstakes. The Grand Prize is $5,000 worth of gift cards for Kroger, while the First Place prize is a $100 gift card for Kroger. The hours of operation will depend on the specific store. Some places are open 24 hours, others run Sun – Sat, 6 AM – 1 AM. Locations that include pharmacies will have separate pharmacy hours as well. To discover specific hours of operation, you will have to check with your local store. With their headquarters in Cincinnati, Ohio, Kroger runs stores in a total of 34 states. They have over 2,000 locations, all a mixture of convenient stores, supermarkets, superstores, jewelry stores, and department stores. To find one near you, they have a store locator page on their website you can use. There are numerous of ways you can contact Kroger. On their website, there is the Contact Us page that contains a link to their comment form as well as ways to reach various areas of the company such as employment opportunities. For consumers, one of the primary outlets to reach their general customer service is by calling 1-800-576-4377. You can also write to The Kroger Co., 1014 Vine Street, Cincinnati, Ohio 45202-1100. Kroger also runs a few social media webpages. You can find them on Twitter, Facebook, and LinkedIn.